As feminists, we believe women should have choices. We believe nothing should stand in the way of a woman living life as best she can. 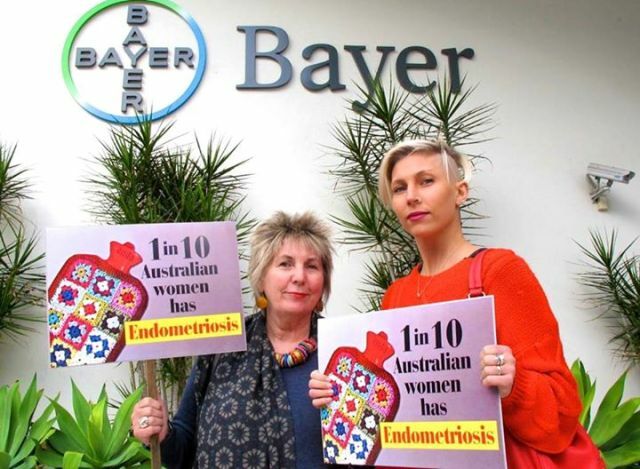 For the half a million Australian women diagnosed with the debilitating disease endometriosis, their autonomy is currently being compromised by pharmaceutical company Bayer. Bayer is considering bringing the drug Visanne into the Australian market after being petitioned to do so in a campaign led by the mother of a 23 year old sufferer. The firm originally believed the product would not be appropriate for sale in the country, but with more than 66,000 signatures (and about 380 pages of testaments) thrown at them, it is considering Lesley Freedman and daughter Syl’s proposal. While Bayer ruminates on the issue for the next few weeks, one in ten women – all potential consumers – will be in “crippling pain”. Endometriosis predominantly affects the reproductive system as the uterine lining attaches itself and causes lesions on organs such as the ovaries (Syl Freedman describes hers as feeling “minced”). It can also impinge on the bladder and bowel. While Bayer holds back an immediate answer, these women’s lives are on hold. ‘Many… are forced to abandon their studies, their jobs and their holidays – landing them on the couch or in emergency [departments],’ petition organiser Lesley says in the campaign rationale. As suggested by Lesley, the toll of the disease is not just physical and emotional but economical. European research shows women with endometriosis spent the equivalent of AU$4,000 per year on health care. The women also lost about $8,000 in wages due to sick leave or other work productivity costs. This equates to $12,000 per year. In a capitalist society like Australia, this is a significant disadvantage to the independence of women and sees many – including students like Syl – unable to support themselves. Endometriosis is nowhere near an orphan disease with 176 million sufferers worldwide. It is ridiculous that such an illness is on the periphery with limited treatment options. Some in the medical community consider it to be more common than asthma and diabetes in women. If Visanne was an asthma or diabetes drug, would Bayer be stalling getting stock on chemist shelves? Lesley sees the issues surrounding endometriosis awareness and treatment as being stigma of periods and women’s reproductive systems. ‘It’s appalling that some doctors send women home saying “get over it, the pain is in your head” and women learn that they have to shut up about it,’ Lesley told one media outlet, reflecting on her daughter’s experiences. After ten years of agony and being turned away from said practitioners, Syl was finally diagnosed at age 21. Late diagnoses such as Syl’s are all too common. It takes 7 to 10 years, on average, for doctors to confirm the condition after the onset of symptoms. Support and awareness organisation Endometriosis Australia puts it down to women and professionals normalising the illness as period pain. This is disturbing, as being able to treat endometriosis early can severely reduce its resulting negative outcomes. Early diagnosis means less discomfort and fewer fertility issues for women desiring children. Syl has had to undergo two operations, extensive recovery periods and still struggles with the disease, hoping for adequate pain relief from Visanne. While the drug may not be the holy grail of a cure, it will benefit hundreds of thousands of women in their pain management. As Sylsays, ‘It’s not about drugs, it’s about the principle that women with Endo deserve to have the choice’. This is so interesting. It’s crazy how much power pharmaceutical companies have over the health of thousands. Lesley’s comments on the dismissal of medical professions harkens back to the tendency to call women hysterical. It happens too often, and is regularly employed to dismiss the suffering of women. This entry was posted in Health and tagged endometriosis, health, menstruation. Bookmark the permalink.